Taking inspiration from Christian Dior’s classic New Look from the 1950s, it’s the season to make a statement with beautiful silhouettes, chic dress and stylish suits. Adding in touches of tweed, leopard print and luxe faux fur details, more is more and it is time to let opulent glamour be the star of the show. With a festive colour palette red, pink, green and white it is time to celebrate the season and go bold this Christmas. This classic retro style will suit every body shape, accentuating curves and enhancing the feminine form. It is time to have fun with your clothes and embrace the festivities! Model wears: Gingham suit jacket, £79; gingham skirt, £45, both Marks & Spencer; roll neck, £195, Iris; faux-fur stole, £14, Peacocks; croc-print mid heels, £70, Dune; gloves, £25, Accessorize; pearl bag, £30, Frank Usher at QVC; brooch, £15, Jon Richard. Model wears: Sparkle dress, £329, Baum Und Pferdgarten at Studio B Fashion; faux-fur scarf, £150, Charlotte Simone; gloves, £22.50, Kaleidoscope; mini bag, £425, Strathberry. Model wears: Green midi dress, £109, Kaleidoscope; cashmere jumper with neon cuff, £195, Cove; heels, £140, Ted Baker; pearl-top clutch, £35, Kaleidoscope; faux-fur stole, £14.99, New Look; striped neckerchief, £15, Accessorize. 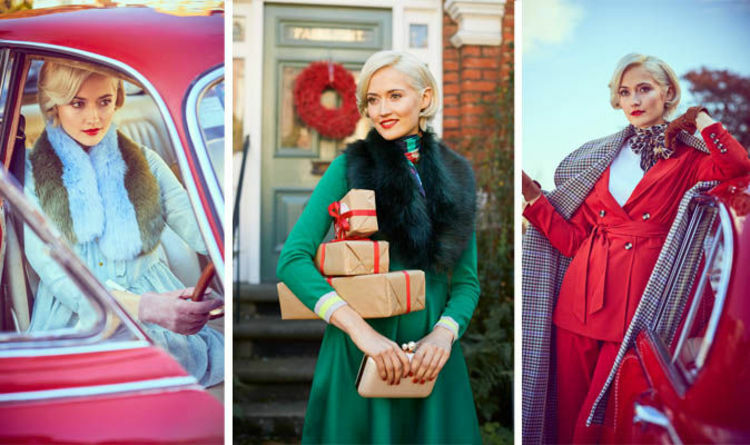 Model wears- Chevron woollen coat, £359, Ted Baker; embroidered jumper,£75, Cath Kinston; block pleated skirt, £39.50, Marks & Spencer; beret, £12, River Island; bow-trim kitten heels, £85, Dune London; small bag, £22,Accessorize. Model wears: Faux-fur off shoulder dress, £285, James Lakeland; studs, £18, Jon Richard; citrine gold ring, £246.66, Chupi; Antella altro grande ring, £149, Sif Jakobs.